The LaCie Sound2 speakers are not your average multimedia speakers. They belong distinctly in the ‘looks like they were designed by a props person for a sci-fi movie’ school of design. 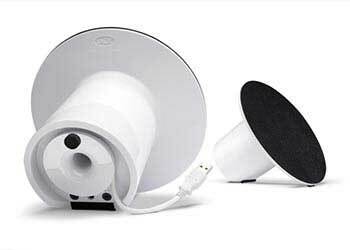 And those that like design like these speakers, as they have been nominated for in the 2010 Red Dot Awards. The LaCie site has the speakers badged as ‘Red Dot Design Award Winner 2010’, which may be over enthusiastic on their part, as the nominations for entries don’t close until April 15. That said, if your taste in design runs the space age then these are just the speakers for you. Neil Poulton is the designer, in association with Cabasse, an audio company with a heritage going back to 1950. You can connect to devices either by USB or speaker jack – handily, the USB cable is built-in, so there’s no issue misplacing it, or wondering which of the mass of spare cables around the house is the one for the job. Driver: Cabasse’s Wide Band ICF Driver – 70mm / 2.75 in. 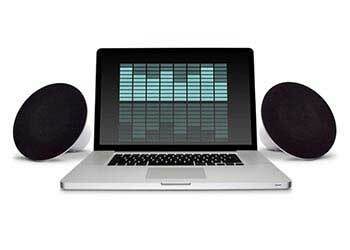 The Sound2 multimedia speakers have an RRP of $149, and are available for purchase from the LaCie website.